DHD vs RNR, 34th match, Bangladesh Premier League 2019. Heino Kuhn or Kieron Pollard can replace Darwish Rasooli in the playing XI. Shafiul Islam has lost his touch after a good start to the season. Spinner Sohag Gazi can replace him. Chances of same are less. Sohag Gazi can also replace Nahidul Islam. Shakib Al Hasan (c), Sunil Narine, Kieron Pollard, Andre Russell, Hazratullah Zazai, Rubel Hossain, Nurul Hasan, Rony Talukdar, Shuvagata Hom, Andrew Birch, Ian Bell, Qazi Onik, Mizanur Rahman, Asif Hasan, Shahadat Hossain, Mohammad Naim, Mohor Sheikh, Heino Kuhn. Alex Hales, Mashrafe Mortaza(c), Rilee Rossouw, AB de Villiers, Nazmul Islam, Chris Gayle, M Mithun, Fardeen Hasan, Shafiul Islam, Sheldon Cottrell, Sohag Gazi, Farhad Reza, Mehedi Maruf, Ravi Bopara, Nahidul Islam, Abul Hasan, Benny Howell, Nadif Chowdhury, Sean Williams. ⚠️BPL Matches are risky they can rest any player without any reason. Sunil Narine, H Zazai, Rony Talukdar, Heino Kuhn/K Pollard/D Rasooli, Shakib Al Hasan (c), Andre Russell, Shuvagata Hom, Nurul Hasan (wk), Mohammad Naim, Mohor Sheikh/Qazi Onik/Shahadat Hossain, Rubel Hossain. Chris Gayle, Alex Hales, Rilee Rossouw, AB de Villiers, Mohammad Mithun (wk), Nahidul Islam/Sohag Gazi, Mashrafe Mortaza (c), Farhad Reza, Nazmul Islam, Shafiul Islam/Sohag Gazi, Shahidul Islam. 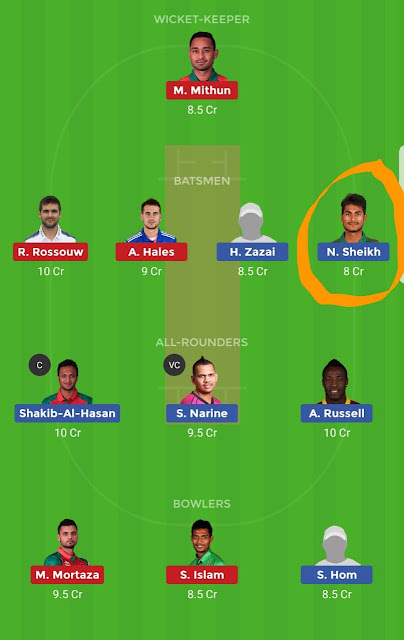 *Not able to pick S Narain or M Mortaza due to credit issue. You can go with any team as per your choice Team 2 is slightly risky team.